Although the main line was itself a signal feat of engineering and political optimism, branch lines were also integral to the Newfoundland railway. From 1915-30 there were five branches in operation on the Avalon and Bonavista peninsulas, connecting historic population centres and linking with the coastal boat service. While branch operations were curtailed during the Great Depression, the Placentia, Carbonear, and Bonavista branches continued until the 1980s. Other lines in central Newfoundland, public and private, helped open up the interior. The Reid Newfoundland Company also built a streetcar system in St. John's, which operated from 1900 to 1948. The St. John's streetcar system operated from 1900 to 1948. From D.W. Prowse, The Newfoundland Guide Book, 1905 (London: Bradbury, Agnew, 1905) 121. From 1880 it was recognized that a trunk line across the unpopulated interior required branch lines, particularly to connect populous Conception Bay with St. John's. The Blackman contract of 1881 provided for a branch line to Harbour Grace (in operation 13 years before the main line was complete) and another to Brigus. The Harbour Grace branch was constructed for the bondholders of the bankrupt Newfoundland Railway Company beginning in 1883, when the company defaulted before reaching Harbour Grace Junction (now Whitbourne). The branch was completed in November 1884 and turned a modest operating profit before being bought by the government in 1896. The Harbour Grace line originally went from Whitbourne to Broad Cove Junction at the bottom of Trinity Bay and then across the barrens to Tilton and Conception Bay. The 13 miles of track between Broad Cove Junction and Tilton, known as the Tilton branch, were taken up in 1915-16. With construction of the main line halted, the government built a 26-mile branch from Whitbourne to Placentia, opened in October 1888. In 1921 3 ½ miles of track were laid to Argentia, which provided a more reliable coastal boat terminal. The branch was upgraded in 1941 to serve the U.S. Navy base. It closed in 1984. In 1897, with completion of the main line, R.G. Reid was contracted to build three small branches. The Lewisporte branch ran 7 miles north from Notre Dame Junction, to connect with the coastal boat service in Notre Dame Bay and provide central Newfoundland with a port. From 1936 this branch was a vital strategic link in the construction and supply of the Gander air base. It also closed in 1984. A "cut off" from Brigus Junction to Tilton via Brigus, and an extension of the line from Harbour Grace to Carbonear in 1898, established the Brigus (or Carbonear) branch. In 1900, in order to encourage a major sawmill, the government hired Reid to build a 19-mile line from Red Indian Lake to the main line. 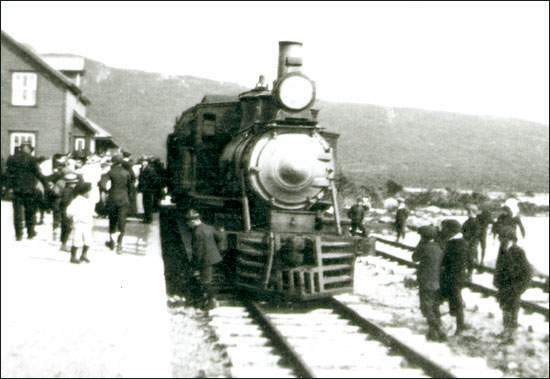 In 1910 the Millertown railway was sold to the Anglo-Newfoundland Development (A.N.D.) Company, operators of the new pulp and paper mill at Grand Falls. The Company built a 19-mile extension to Lake Ambrose, the Harpoon Logging Railway. Used primarily to carry pulpwood, the two lines were dismantled in 1957. The A.N.D. Co. Railway also included a line from Grand Falls to the port of Botwood (sold to a private operator in 1957). Other private railways at the turn of the century include the 7-mile Workington Railway, from a mine of that name near Lower Island Cove to Old Perlican (1898-1901), and a 6-mile 24in. gauge cable railway at Bell Island mines. Making the approach over Red Indian Lake dam to Lake Ambrose on the Millertown/Harpoon Logging Railway. 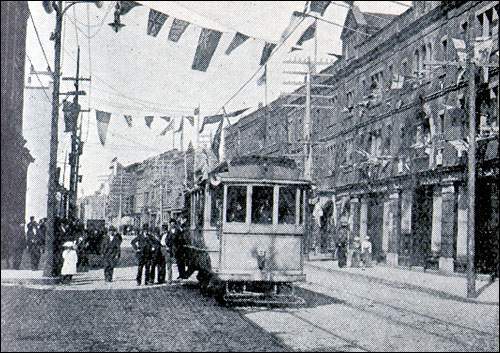 The 1898 Railway Contract provided for Reid to build a street car system for downtown St. John's. The St. John's Electric Street Railway was integrated with the first hydro-electric development in Newfoundland, a plant at Petty Harbour. The system was operated by the Reids from 1900 to 1924, and by the St. John's Light and Power Company -a Reid subsidiary- from 1924 to 1948. In 1909 the People's Party of Sir Edward Morris was elected, having promised a program of branch line construction. The new branches, although popular in the older areas of settlement which they were to serve, did not open new areas or encourage new industries of note. The first new branch was an 88-mile line to Bonavista, which opened November 1911. The longest, at 104 miles, the Trepassey branch was constructed 1911-13, providing a rail connection to St. John's from the Southern Shore. Along the south side of Trinity Bay, the Heart's Content branch (42 miles, but incorporating parts of the original Harbour Grace line) was completed in 1915. Finally, the Carbonear branch was extended by a 48-mile line to Grates Cove-Bay de Verde in 1915. This extension was closed in 1930, however, the branch continued to operate to Carbonear until 1983. With the onset of the Great War, the branch line program was halted before the last two lines were complete. The Fortune Bay line, intended to be a 57-mile link to the coastal steamer at Terrenceville, was abandoned in 1915, although 43 miles had been railed. The Bonne Bay branch, projected to run 35 miles north from Deer Lake, was abandoned with the line partly graded. The new branches proved expensive to operate, carrying only passengers and occasional freight. After the government took over the railway in 1923 an effort was made to serve the less-travelled lines using trolley-like "day coaches" on the Bay de Verde, Trepassey and Heart's Content lines. The Bay de Verde and Trepassey lines were closed in winter, and in 1931 were closed altogether. As Heart's Content was a winter port for the A.N.D. Company that line continued sporadically until 1938. The Bonavista branch remained in operation through the summer of 1983. Map by Tanya Saunders. ©2001 Newfoundland and Labrador Heritage Web Site. 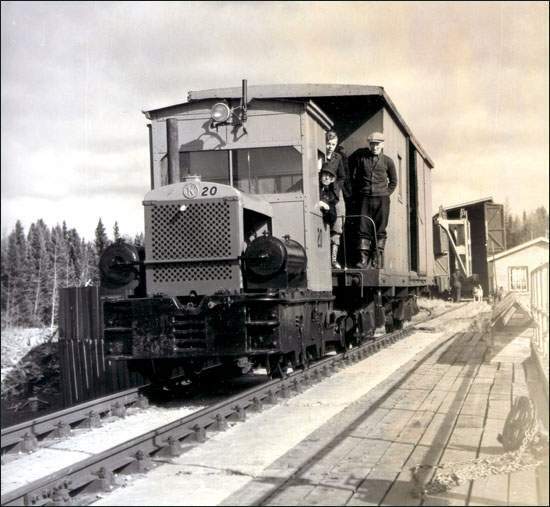 In 1928 a 19-mile branch connected the new mining town of Buchans with the Millertown railway at Buchans Junction. It remained in operation (also employing sections of the Millertown line) until the final trainload of ore was shipped in 1977. Another private railway was built for the mill yard at Corner Brook, and Bowater's also had a 20-mile logging railway from Deer Lake to Adie's Pond, on the Upper Humber. The demands of World War II not only saw increased use of all remaining branches, most particularly Lewisporte and Argentia, but also the last railway line to be built in Newfoundland. In 1941 the United States Army began a 10-mile line from USAF Base Harmon Field (Stephenville) to the main line. The USAF line continued in use until 1963.